If you have a few minutes at the end of this tutorial, you can also follow a 20 minutes webinar here, where our Community Manager does a complete review of the site and shares some interesting tips that can help you enjoy Toluna to the fullest. Do you think global warming is a short*term threat or a long-term threat? To add an image or a video simply click the camera icon, or video camera icon and upload your own photos or use our search tool. Click here for a complete tutorial on how to add images/videos. *Quick Tip* Content that includes a photo or video tend to be more interesting to members than ones that do not include this feature. In fact, our Toluna Team members may even send you some bonus points. 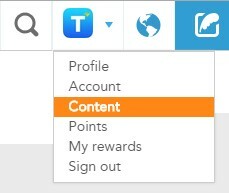 Once your topic, poll, thumb it or battle is launched, you can keep an eye on the results by going to your profile page, or by going to your “Content page” in the drop-down menu under your profile picture.